Until last week, when I thought “Grand Canyon,” mental images of rim-top panoramas, plunging cliffs, and sculpted red layers came up. With no firsthand history to instruct me, my mental picture of the Grand Canyon from the bottom was an inverted version of my experience from the rim. But last week I finally had the opportunity strike the Grand Canyon raft trip from my bucket list, six days of complete canyon immersion that completely reset not only all preconceived biases of the down-up experience of the Grand Canyon, but also of my place in the Universe. Descending into the Grand Canyon is like plunging into a serious relationship—it’s not long before you start understanding that the view from the outside, as compelling as it might be, is the superficial view. Floating on the Colorado River’s smooth jade, careening through its churning whitewater, slipping from brilliant sunlight to cool shade cast by the towering remnants of ancient oceans, reveals intimate details impossible to comprehend from the outside. And falling asleep beneath an impossible starlight blizzard is equal parts breathtaking and humbling. The whims of the Colorado River and the practicalities of keeping two rafts and 28 photographers on a six-day, 188 mile schedule meant photography wasn’t the trip’s top priority. Often we’d arrive at a breathtaking location in the absolute worst light for photography, but so awed were we by the majesty of our surroundings that the quality of the light rarely seemed to matter—among the many lessons the group learned on this trip was that our experience as humans transcends our needs as photographers. Additionally, I’m guessing that most of the group would say the relationships and memories we formed trumped the photography as well (I know they did for me). That said, I think everyone was pretty thrilled by the images they returned with, and I came home with a plan to ensure more photo opportunities in the next trip (yes, there will be a next trip). For the next few weeks I’ll be sharing some of my images from this trip that started as a lifelong dream and came to fruition with the help my good friend and fellow photographer Mark Zablotsky. Mark (wisely) identified Western River Expeditions as the best candidate to handle our unique needs—they came through with flying colors, offering suggestions, being flexible at every opportunity, and providing the best guides in the world (no exaggeration). Since this would be my first time in the canyon, I wasn’t comfortable treating the trip as one of my workshops and didn’t advertise it anywhere (it turns out I didn’t need to), nor did I attempt to profit from it. Nevertheless, I was a little concerned that the cost would make it difficult to fill two rafts, but after sending an e-mail invitation to past workshop participants (exclusively) last September, within 48 hours all 28 spots were filled, with five on the waiting list. Twenty-eight people meant we’d have two full rafts, plus our own cadre of four river guides, allowing us to customize the trip to our needs as much as the conditions, river, and National Park Service regulations allowed. For example, WRE was able to accommodate our photography needs by arranging space for and easy access to serious camera gear. My F-stop Guru bag included my Canon 5D Mark III body and my 16-35, 24-105, 70-200 and Zeiss 28 prime (for night photography) lenses, plus a Gitzo 1530 tripod and Really Right Stuff BH-30 ball head. Most people in the group had a similar setup—some with a little more, some a little less. Hike, photo stop, and campsite choices emphasized photo opportunities over things like Grand Canyon history, geology, and what was most convenient for the guides. 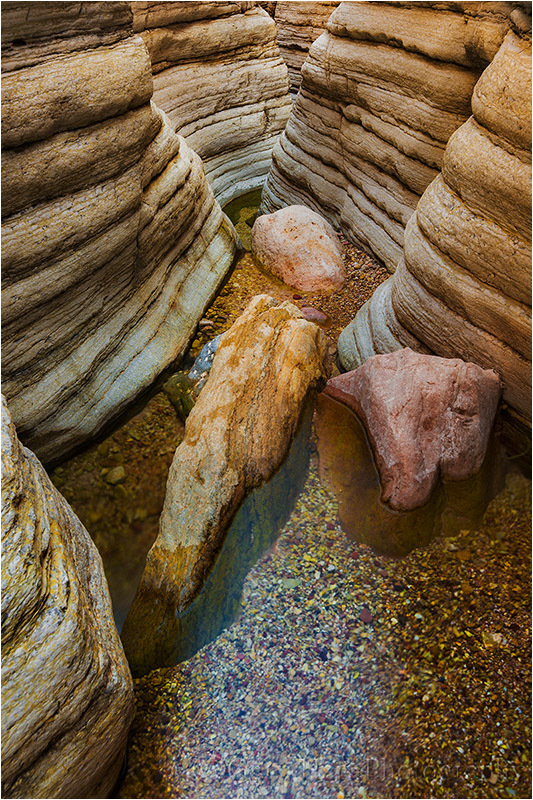 The above image is from Matkatamiba Canyon, a narrow (!) 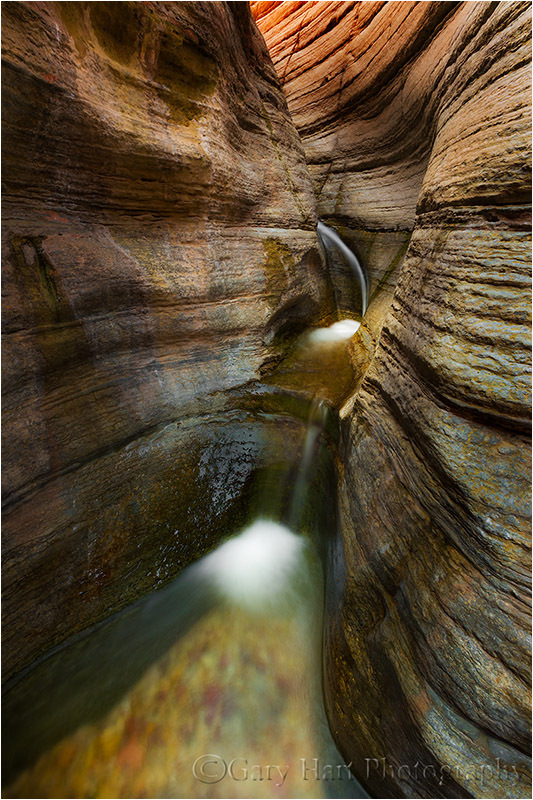 slot canyon, carved in 500 million year-old limestone, that we were told is rarely visited on the “conventional” raft trips. All week Wiley, our trip’s lead guide, had been telling me how much we’d love Matkatamiba Canyon (I listened to the guides pronounce the name all week but it wasn’t until I got home and looked it up that I was completely sure what they were saying), and I have to tell you that it disappointed no one. But I also understand why most trips skip it. The challenge at Matkatamiba is access—the first 100 yards or so was navigable by everyone, but continuing beyond that involved some pretty technical (for climbing novices lugging photo gear) scrambling. Reaching this spot required teamwork to scale a five-foot waterfall that blocked access to the canyon’s narrowest upper reaches. The waterfall barrier didn’t look too difficult from beneath, but water-smoothed limestone spread with wet moss made footholds impossible. Instead, each of us temporarily shed our gear and handed it up to the person preceding us, then wedged our bodies between the narrow walls, back pressed to one wall and feet planted on the other (so our bodies were horizontal, spanning the creek), then “walked” parallel to the ground up the walls to the top of the fall. Beyond the fall the canyon’s twists and turns added intrigue, as it seemed like the scene around each corner was even better than the previous scene. Occupied refereeing the photo needs of those below the fall meant I was among the last to ascend to scale the waterfall. While that meant I didn’t advance quite as far as most of the others, it also gave me more alone time with the scenes I found. I composed this image with the cascade nearest the frame’s top, bottom, left, right, and center, ultimately choosing the symmetry of this centered version. Often symmetrical images can feel static, but I felt in this case that the arc of the creek adds a dynamic that cancels any static concerns. Though my extreme wide focal length gave me lots of depth of field, I was careful to favor the focus on the right wall, where I thought the sharpness was most important. Polarizing the scene removed glare from the rocks and creek, and helped the color of the submerged stones stand out. The farther up the canyon I climbed, the narrower it became. I’m in for next year !!!!! That would be great, Dotty. We already have tentative dates, though they’re still subject to change. As with this year’s trip, next year’s will start as invitation-only, so if you’re interested in joining us drop me an e-mail, Facebook message, or website contact message with your contact info. Beautiful, awesome etc.etc………….keep em coming! I’m so glad to see your image Gary. It is beautiful and I appreciate that you share the technical decisions you made to make this image. Great description of the trip. Let me know when you and Mark are going next time. I’m in! Gary, when using your 28mm prime Zeiss for night time photography, do you need to worry about finding a bright distant object and manually focusing on it or will it automatically be setup for infinity? In your opinion, is it worth getting a prime if you do a lot of night time photography? Great image as always. I definitely would be interested in making this trip! Hi Greg. I use my Zeiss prime lens in the dark enough that I can find the infinity point (just slightly before the max point) with a pretty good degree of confidence. Nevertheless, I always take a high ISO test shot and check the focus by maximizing the image in my LCD. Regardless of the lens, I’ve had pretty good success finding the infinity focus point for any focal length of any lens by centering my viewfinder on the brightest star/planet, switching to live-view and magnifying 5X, re-centering, magnifying once again to 10X, then manually focusing on the star/planet in the magnified LCD (turn my focus ring until the point of light is smallest). But I still verify with a text exposure. why this lens “attach my 28mm Zeiss f2 (my night lens)” besides obvious it is a zeiss lens, is it especially good for night things ? Well, aside from the fact that Zeiss may just make the best glass in the world, this is my night lens because it’s my fastest lens, and it’s fairly wide. I really like how the light just gently blankets the walls in this Gary. The trips sound like a great adventure I’d like to do someday.